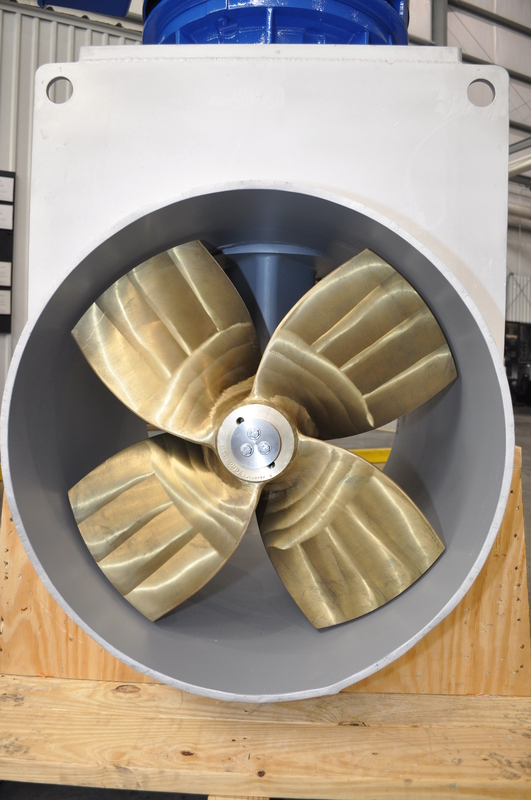 Thrustmaster geared tunnel thrusters are used to develop lateral thrust under extreme load conditions in demanding offshore applications for dynamic positioning or for slow speed maneuvering of marine vessels and are available from 150 hp (100 kW) up to 5,000 hp (3,500 kW) with tunnel diameters from 30 in. (762 mm) up to 136 in. (3,455 mm). Made with fixed pitch propellers, Thrustmaster’s tunnel thrusters are designed for diesel engine driven or variable speed electric motor input in the L-Drive configuration. 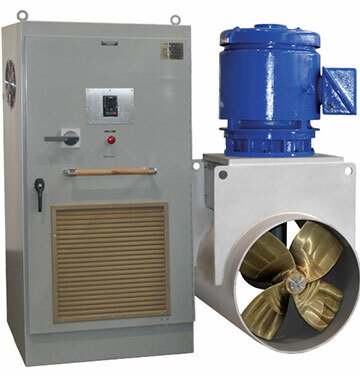 A bi-directional electric motor with variable frequency drive can be mounted horizontally or vertically on the thruster depending on the given space restrictions. A diesel engine with a marine gear can also be used. 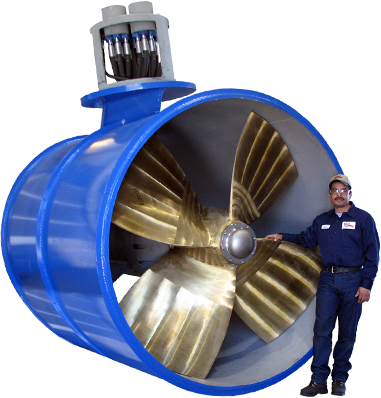 Thrustmaster tunnel thrusters have been installed in many vessels operating around the world. 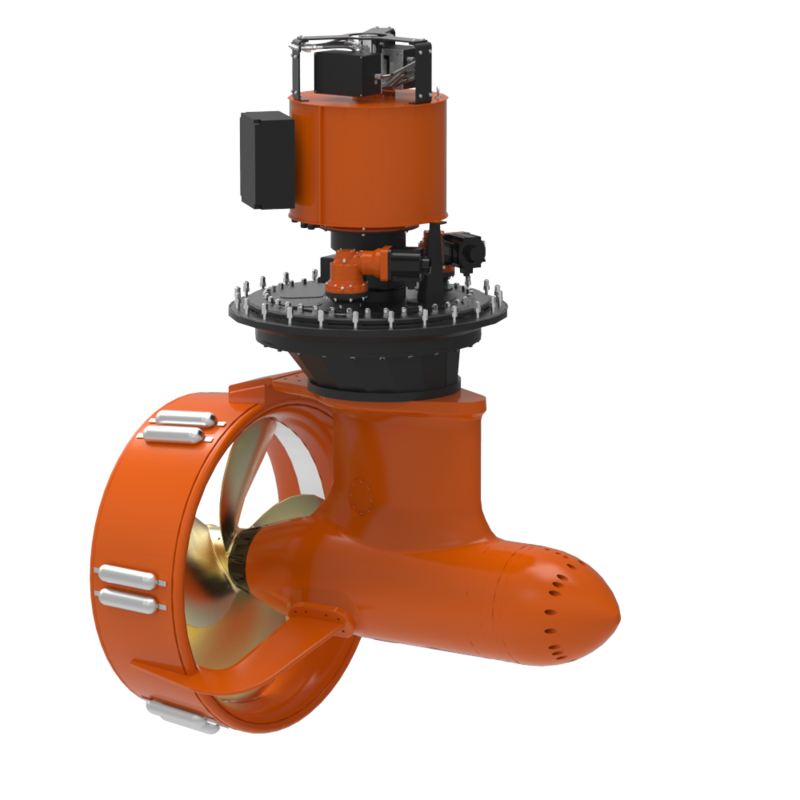 Thrusters can be supplied complete with electric motors and drives or they can be made to fit flange and shaft end of a customer supplied or shipyard supplied electric motor. Many sizes are available. Please contact our sales department for your application. Some models have ABS Type Approval. 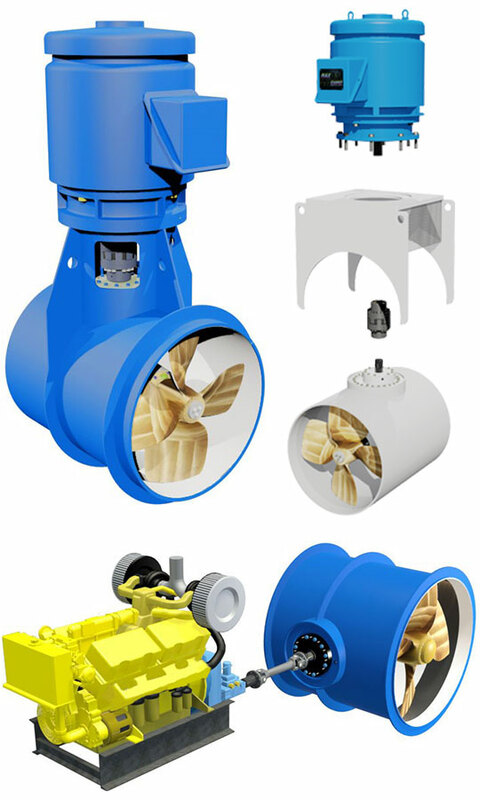 The propeller is a four blade symmetrical tunnel thruster propeller with fixed pitch. It is cast from nickel aluminum bronze. 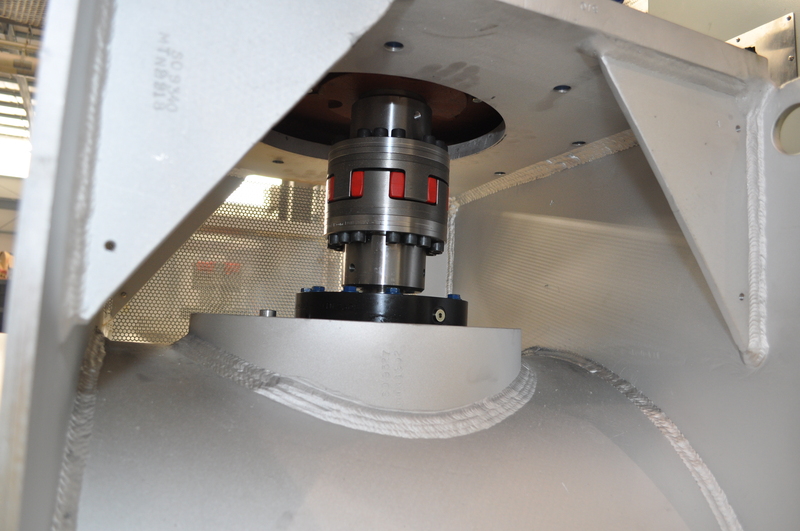 The propeller shaft seals are contained in a 316 SS seal housing with rope guard. The seal housing is provided with bidirectional line cutters, preventing fishing lines and nets from damaging the seals. (For thruster models up to and including 90TT2000ML) The thruster assembly is fully flooded with lubrication oil. A sepa-rate header tank is provided for installation above the vessel water-line to help prevent incursion of water into the propeller shaft seal. The header tank is a steel tank complete with level indicator, tem-perature indicator, filler/breather, and LOW/HIGH level switch. A sight glass is also included to visually monitor the oil level. Thrusters larger than model 90TT2000ML use a lube oil circulation system for cooling and filtration of the lubrication oil. The lube oil circulation system is a skid mounted packaged system comprising an electric motor driven screw pump, a filter unit and a heat exchanger complete with interconnecting lube oil piping within the skid limits. The lube oil expansion tank may be provided as a separate item for installation above the maximum waterline of the vessel. As a rule of thumb, a bow thruster used for docking and undocking should be capable of producing thrust in pounds of force (lbf) equal to twice the lateral cross sectional vessel area below the water in square feet or two to three times the lateral cross sectional area of the superstructure above the water, whichever is greater. Sizing of tunnel thrusters for slow speed maneuvering and station keeping depends greatly on the vessel operating parameters. Before making your final selection, consult your naval architect or one of Thrustmaster’s application engineers. When using tunnel thrusters in waters with high current or while the vessel has forward speed, the thruster becomes less effective. At vessel speeds of 3 knots, the tunnel thruster may lose as much as 25 percent of its thrust. At speeds of 7 knots, the thruster may only produce half of its rated thrust. A Thrustmaster retractable azimuthing thruster may be more appropriate for these applications. If space does not allow proper submergence with a single tunnel thruster on a shallow draft vessel, two or more smaller tunnel thrusters, installed side by side, may be used. Multiple Thrustmaster tunnel thrusters can be powered by a single prime mover with a common hydraulic system, making the thrusters act in unison as if they were a single thruster.